L'Heure d'été (Summer Hours) is a French language film about a family whose matriarch, Hélène (Edith Scob) passes away rather suddenly. 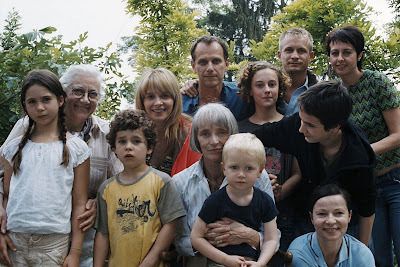 Her children, Frédéric (Charles Berling), Adrienne (Juliette Binoche), and Jérémie (Jérémie Renier) all loved her, and each other. But our globalized society keeps them apart. With Adrienne's job in New York, and Jérémie's in China, Frédéric is the one who must assume responsibility for her estate. The house, in the family for generations, must now be sold, reluctantly by Frédéric, and Hélène, niece of a famous artist, had amassed quite an art collection, mostly through inheritance, as well. One of the byproducts of globalization is the impact it has had on families and art, as we see in this film. Assayas examines the way the house and these art objects hold not only economic value, but sentimental value, for the family, particularly for Frédéric, who is more rooted in France than the other siblings. The other siblings, though still attached to these, are conscious of their inability to transport them into their far-flung new lives abroad. And even the intrinsic value of the pieces, and the house, as historical objects dissipates when removed from the context of the family relationships to the items. This is evident when the committee at the Musee D'Orsay, the museum which takes in the collection, starts to examine each item divorced from the family context, and in the greater context of whether it will attract interest to the collection or not. Frédéric is the linchpin in the story. He represents the intergenerational crossroads of the family. For him, the family history and roots in France are the most important. We see this in his affection for two Corot paintings that he wants to pass on to his children. We also see that in his mother's recognition that he should be the caretaker of her legacy. But it is most evident in the spiritual inheritance he has left his daughter. The teen is arrested midway through the film for shoplifting and possession of a small amount of drugs. She doesn't seem to be a criminal type, just participating in carefree shenanigans. When she has a huge party at her grandmother's now empty house, our perception of her as an ignorant youth doesn't change. But in a moment alone with her boyfriend, in the field by the house, she cries as she speaks of a memory of her and Hélène picking fruit there. She realizes that this field which her grandmother said she would pass on to her father, then to her, and on to her children, is leaving the family's dominion. And we have hope that even in the next generation of "global" babies, some sentimental value will still be cherished.